Welch’s is named after company founder Thomas Bramwell Welch. In 1849 in Concord, Massachusetts, after more than ten years and 22,000 crossbreeding experiments on 125 grape vines, Ephraim Wales Bull developed the sweet and palatable Concord grape. In 1869, physician and dentist Thomas Bramwell Welch and his son Charles pasteurized Concord grape juice to produce the first “unfermented sacramental wine” for fellow parishioners at his Methodist church in Vineland, New Jersey, where the elder Welch served as communion steward. In 1893, thousands of visitors at the Chicago World’s Fair sampled Dr. Welch’s Grape Juice. Welch’s son Charles quit his dentistry practice to devote his full attention to marketing the grape juice, adopting a new label that dropped the word Dr. before the name Welch’s. Jelly is made from fruit juice, jam is made from pureed fruit, preserves are made from whole fruit, and spreads are made from whole fruit and/or pureed fruit. Welch’s developed its first jam product—Grapelade in 1918. The United States Army purchased the entire first production run, and soldiers returned to civilian life as loyal customers. 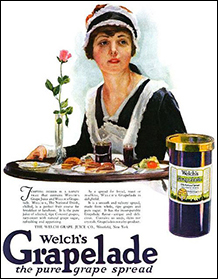 Welch’s did not introduced Concord Grape Jelly until 1923. In 1949, Welch’s launched Welch’s Frozen Grape Juice Concentrate, becoming a pioneer in the frozen juice concentrate industry. In 1962, Welch’s sponsored the animated television series The Flintstones. Welch’s headquarters are in Concord, Massachusetts, the namesake of the Concord grape—where Ephraim Wales Bull lived and developed America’s premier native variety. Today, Welch’s is the food processing and marketing arm of The National Grape Cooperative Association, Inc., a grower-owned, agricultural cooperative founded in 1945. Copyright © 1995-2019 Joey Green. “Welch’s” is a registered trademark of Welch Foods Inc.